It was quite the hat-trick for Rodgers & Hammerstein to follow up the biggest musical smash Bway had ever seen with a show such as Carousel. Despite the inevitable comparisons (and similarities, of which there were many), the show defied all odds by standing on its own, even more revolutionary pedestal. It was also a hit. The rulebook for Bway musicals was being radically rewritten. Given their fierce protectiveness over Oklahoma! 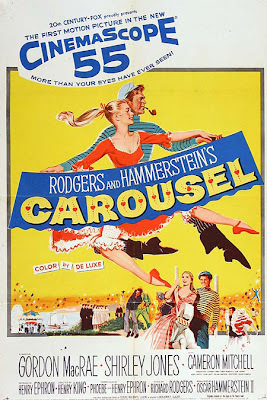 one can only wonder why R&H so quickly acquiesced on film rights for their other great hits, particularly a show as delicate and precious to them as Carousel. But they were already tangled with Fox, beginning with State Fair in ’45, and the studio’s eventual distribution of Magna’s Oklahoma! Fox also owned an early film of Liliom (the source for Carousel), and their ’46 movie, Anna & The King of Siam, with Rex Harrison & Irene Dunne, was the true origin of The King & I, not Margaret Landon’s book. But once they sold, R&H had little input on either film. This was suffered more by Carousel, a movie torn in too many directions—old & new. Of all their filmed shows, surely this was the most difficult to translate its numerous theatrical conceits onto the screen. Beginning with a staged instrumental prologue, several extended musical sequences break the usual mold: a sung-thru courtship, a mammoth soliloquy, a symbolic ballet. The story itself veers from naturalistic (and dialect-happy) Americana into celestial fantasy and religious uplift. Hammerstein’s book was adapted by Nora Ephron’s parents: Phoebe & Henry, studio contract writers who were somehow elevated to producers for the first time with this production. Given their previous musical credits (as writers only) were On the Riviera, There’s No Business Like Show Business and Daddy Long Legs, it’s not an obvious assignment. Nor was the choice of Henry King as director—a 70 year old who’d been in films since 1915, but was still active with such recent hits as David & Bathsheba, The Snows of Kilimanjaro & Love Is a Many Splendored Thing. After Zinnemann and Mankiewicz, prestige drama directors were now sought over helmers with musical experience. But where Zinnemann made sure to have Agnes DeMille (and Mankiewicz, Kidd) to handle the musical staging, Fox didn’t seek DeMille’s participation this time around. Or anyone else’s for that matter connected with the Bway production. But Fox did copy some of the advances R&H were attempting with Magna’s Oklahoma! 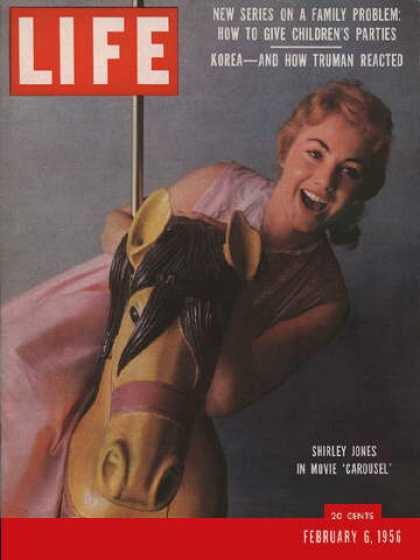 : location shooting; reverence for the original material; extended length; “new” widescreen technology: “Cinemascope 55.” As well as star-in-the-making: Shirley Jones. They also had Sinatra. Now a genuine movie star as well as the world’s most popular singer, it would seem that every new musical headed for the screen would start casting, by default, with Frank and move from there. He’d recorded songs from the show, including the “Soliloquy” as far back as ’45, and the role of Billy Bigelow was highly coveted. Visions of Oscar danced in everyone’s head. But the aforementioned Cinemascope 55 required (as had Todd A-0) two takes for a backup version. Once on set Sinatra balked at giving “two” performances and walked off the picture. One wonders if there were other factors to give him pause, but it remains for us to speculate how different the film would have been with him in it. Left in a pinch, it wasn’t much of a leap to engage Gordon MacRae, like Jones, fresh off Oklahoma!—their chemistry already sealed on celluloid. The part isn’t quite the fit that Curly was for MacRae, but he certainly sings it well, and he looks rough enuf too. But there’s a sense of him emoting the role, not embodying it. You can see how Sinatra would have slipped into the bad boy more smoothly, or maybe the bad boy would slip on a bit of Sinatra—either way likely to have been a little more…shall we say, memorable? But MacRae is certainly no deficit to the film. As Hlwd’s newest Golden Girl, Shirley Jones went from Laurey to Julie Jordan with barely a pause (tho other candidates were said to be Jean Simmons and Jane Powell—God forbid.) As Julie she’s far too young to add much gravitas to the final scenes, and you don’t really see the pain she’s endured post-marriage, but she’s so ripe and exciting in the opening scenes—so ravishingly young and beautiful—we’re easily convinced how Billy’s jaded head would be turned. The best scenes in the film are easily these early ones—where the sexual tension is so palpable and their truest characters emerge; Julie’s ferocious independence, Billy’s softness and generosity —something we never really see again. Fox cast the supporting roles with obscure, rather than well-known players. As Carrie, Barbara Ruick has a chipmunk smile and a goofy presence next to Jones’ unwavering sincerity. 40-something Robert Rounseville was an opera tenor who scored two musical coups in 1956: Mr. Snow in this film, and the title role on Bway in Leonard Bernstein’s Candide—a quick flop, yes, but his voice forever sealed on disc. If Carrie & Snow serve as secondary interest much as Will Parker & Ado Annie did in Oklahoma! then Jigger Craigin fills in for Jud Fry—tho here he (somewhat inexplicably) accosts Carrie and not our heroine. Cameron Mitchell, a rugged-looking minor leading man (one of Willy Loman’s sons in the original Bway Death of a Salesman) plays him as a cartoon villain serving little purpose other than to lead an already delinquent Bigelow to his death. But the robbery sequence is dreadfully jejune—shackled, perhaps to its source in a play from 1905. Here it seems so ill-conceived, so amateur as if performed by two impulsive teenagers robbing a liquor store. It makes no logistical sense, they don’t even attempt to disguise themselves—and what were they planning to do afterward? Hammerstein has Jigger explain they’ll bury the money and wait six months, then buy passage on a ship. But why the Ephrons would omit such an important detail but keep a drawn-out and superfluous card game while the men await their prey is beyond me. The role of Mrs. Mullin never made much of an impression on me before, but perhaps because Audrey Christie is such a fine actress, I sat up and took notice for the first time. There’s something rather seedy and interesting in the motherly lust she holds for Billy, and her shared grief with Julie at his death is a nice detail. Christie has a bit of Eileen Heckart in her, but she’s prettier and manages to make you like her even when she’s (usually) an antagonist. But the film’s true Earth Mother is Julie’s cousin, Nettie. (Why do so many R&H heroines seem to be parentless?) 36 year-old Claramae Turner, a Metropolitan Opera star who made virtually no other film appearances, commands the role beautifully. She has a lovely presence, warm and inviting (reminding me of the regal Italian diva who parades thru Fellini’s 8 1/2 ½: Caterina Boratto). Curiously it is said the song “I Left My Heart in San Francisco” was written for Turner, who apparently introduced it. She is so striking in voice and countenance I wish they had used her later for the Mother Superior in The Sound of Music. Carousel, the movie, begins with Billy already in the hereafter (and the first pre-credit sequence in this survey), framing the story as a flashback. It’s a smart choice, pre-empting the startling third act shift of the play (from naturalism to fantasy), and setting up a theme of redressing unfinished business. As the film dissolves back to 1873 on the urgent sweep of the famous “Carousel Waltz,” we are as giddy with anticipation as the two young girls who enter the carnival midway. But tho the scene plays with much narrative energy, it is sadly not edited well to the music—the great composition doesn’t even end so much as abruptly fade out. And so the pattern is set: ample and often careless musical editing abounds. All the sung exposition between Julie & Carrie is reduced to dialogue until Carrie launches “Mr. Snow” only at the refrain. The famous Bench Scene, one of the first and best examples of the maturing musical theater, was likewise snipped of its lead-in. Billy sings some of his recitative passages after Julie’s first refrain, but “If I Loved You” turns into a picture postcard from a Romberg operetta, complete with a glass-smooth studio pond reflecting pink-fabric blossoms. For all its outdoorsy nature Oklahoma! had at least a few scenes set inside. Carousel is nothing but exteriors—unless you count “heaven,”—but then what else could “heaven” be but a set? Some of the film was shot in Boothbay Harbor, Maine, but not as much as they’d like you to believe. It’s a lovely place, as effective and evocative as Nogales was for Oklahoma!—but also refreshingly different: an Eastern! The first scene after the prologue, in the woods (where Mrs. Mullin accosts Julie & Carrie) shot at that elusive “magic hour,” is positively ravishing in its naturalism, which only makes it more jarring when moments later the girls step onto an obvious Hlwd soundstage for the rest of the Bench Scene. Likewise we’re taken under the spell of the fishing port for “June is Bustin’ Out All Over,” and the sail to the clambake, during which Mr. Snow & Carrie sing “When the Children Are Asleep,” only to arrive at a soundstage island. But it isn’t merely this mix of locations with sets—that even Oklahoma! couldn’t avoid—but worse: a number of stand-in locations. How appropriate to set Billy’s “Soliloquy” on a deserted beach—but not one so obviously off the coast of Malibu. The same California beaches show up later for daughter Louise’s ballet, and worst of all the “climb” back to heaven at the film’s end with the sun going down over the Pacific. I’m sure they thought no one would notice, or care, but I think such shifts in mood and feeling chip away at our connection and involvement. This isn’t, after all the old Fox of Weekend in Havana, but the new post-R&H Fox—tho it’s clear they had yet to figure it all out. lobsters out of the driftwood fire? Why are they reminiscing about an event they’re still enjoying? I’ve always felt the song was a bit of a parody itself, (maybe it’s just the word “clambake” that sounds funny) but this is absurd. The whalers’ chorus, “Blow High, Blow Low,” however, was rightly deemed extraneous (whalers have nothing to do with the story) and omitted. Still how can one say anything against the score? It was Richard Rodgers’ own favorite composition—which if we are to love his music, and we do, we must respect. It isn’t my favorite—but we’ll get to that, eventually. I had the album as early as 7 or 8 (it came in the big Capitol box set along with Oklahoma! and The King & I. Of the three records it was understandably my least favorite—in part because I’d seen the other two movies. This made Carousel the first musical I would ever experience first as a record—a novelty that quickly became the norm. Of course I was also too young for it then, tho not too young to be enchanted with the excitement of the opening waltz—a semi-classical composition that to me rivaled such toe-tappers as Offenbach’s can-cans and Sousa’s marches—music I’ve been told had me Michael Kidd-ing it in the crib. But Carousel has less catchy songs than complex scenes, entire three-act plays even within single numbers; and a vague liturgical feeling that turns some songs into spiritual anthems. Note too it was this soundtrack, not so much the Decca original cast discs that found its way into more American homes than any other version of the show. Riding that mid-century R&H tidal wave, it hit #2 on the Billboard album charts and hung around for 57 weeks. But it would be many years before I would come to fully appreciate the score, and then more from a 1987 studio recording with Barbara Cook, having long since abandoned the soundtrack. (Paul Gemignani’s conducting of the newly orchestrated “Carousel Waltz” is, I believe, the most spectacular version ever recorded.) Listening to the soundtrack again now I find little to carp with—the extended dance and ballet music (not on the original record, but on the CD reissue), as always with Rodgers’ works, is gorgeous in symphonic form. R&H held the rights for their blockbusting shows for so long that once the floodgates opened you can understand Hlwd’s rush to get them up on screen. But in retrospect it seems baffling why Carousel would be released a mere 4 months after Oklahoma!, particularly as the first film was barely out the gate, still playing roadshow engagements in major cities. 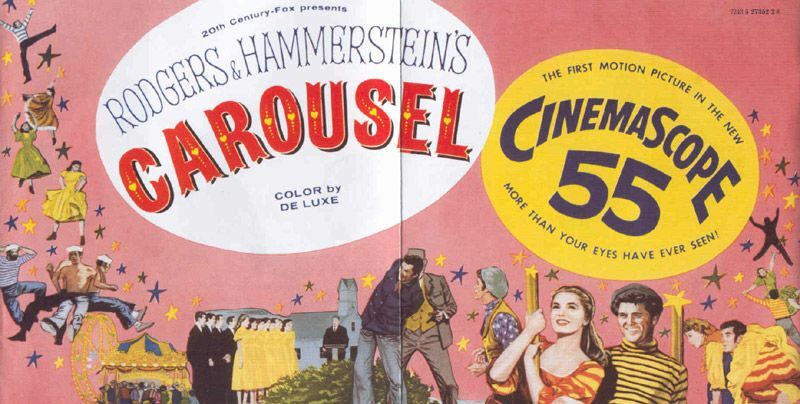 Fox eschewed such a launch for Carousel, thus ensuring a faster, wider, national release—which meant that for more Americans Carousel was their first access to a R&H film. The movie opened at the Roxy Theater in New York, along with an ice-show on Feb 16, 1956, and at Grauman’s Chinese in Hlwd. With their first two films in circulation and a sellout new show on Bway (tho Pipe Dream was poorly received and would run out of steam quite shortly) R&H were Kings of the World. But aside from Bway’s other current sellout, Damn Yankees, the Big Street was already buzzing a show out of town: soon to be the era’s defining landmark—the apex of the R&H revolution and the start of a 10-year period of unmatched Bway classics—many of which became Hlwd classics as well: Lerner & Loewe’s My Fair Lady. 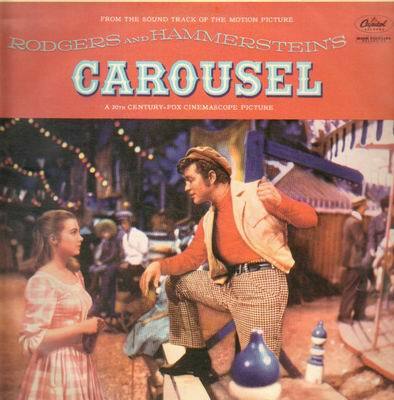 The final take for Carousel was $3,750,000—a decent showing, but in light of the recent smash grosses for musical films, had to be a disappointment. There’s a reason for that beyond the too-quick release date. When I finally first saw the film—on our B&W family TV—it was on the ABC Sunday Night Movie, making its broadcast debut on March 13, 1966. I was only 13 years old, and really too young to appreciate the tragic romance or sexual undercurrents of the story. R&H are seen as purveyors of “family entertainment,” but this is really a show for adults. In May ‘67 a TV version aired (on ABC?) with Robert Goulet as Billy and a complete unknown—before or since—Mary Grover as Julie. Done on typical TV studio sets, with the sort of skeletal frames ubiquitous in ‘60s variety shows, it made no more purchase on my affection than the movie had. Tho a hardy stage perennial, the show was nonetheless said to be “rediscovered” in ’92 with Nicholas Hytner’s new staging at the Royal National Theater in London, eventually winding its way to Bway and a national tour. Bringing to fore the “subtext,” Hytner’s dramatic focus was hailed as a revelation. When Brooks Atkinson posed the question, “Can you draw sweet water from a foul well?” he was speaking of Pal Joey; his distaste for a character who’s merely opportunistic and promiscuous. Yet five short years later neither he, nor anyone else, seemed to object to Billy Bigelow—a role quickly taken for granted as one of the great leading parts in musical theater. But Bigelow is a bully and a coward, and upon any examination—despite Julie’s undying forgiveness—a thoroughly despicable man. Gutlessly, he takes his own life rather than face justice—then crows in the afterlife about being judged by “the highest judge of all.” The movie softens this by having him fall on his own knife (sound familiar?—in many ways it seems like a rewrite of Oklahoma! if Julie had chosen Jud Fry) But the film also adds more surly behavior such as Billy’s childish dismissal of Mr. Snow, on the verge of being offered a job. There’s nary a moment of kindness or caring from the man beyond the early courtship scene with Julie. They’re barely married two months and he’s already a lout; a moocher and miscreant, who despite his youth and vigor hasn’t the “skills” for any work. The famous “Soliloquy” which pummels audiences in its theatrical daring and emotional resonance comes to have little bearing on Billy’s convictions—his selfishness and cowardice leaving his wife a penniless and pregnant widow. Even the ending which purports to catharsis and redemption is really thru no action of his own. After first scaring his now teenage daughter, he strikes her (more on that later) and then blows in her ear during graduation. But they aren’t even his words: the old graduation speaker is the one who intones the class to stand on their own feet and not let their parents failures hold them down. Billy can only whisper, Yes, believe what he’s saying. What kind of hero is this? What has he—or for that matter Louise or Julie—learned from this heavenly visitation? Sadder still is the realization that 15 years hence, Julie hasn’t moved beyond her one-season romance and marriage and found herself a nice respectable husband. (Nor, apparently has the town stopped snubbing her.) She’s carrying that torch for life. And that is the elephant in the room about R&H’s magnificent creation: at its core it’s the most exquisite apologia for domestic abuse. Julie is the classic battered spouse, rationalizing all of Billy’s behavior to the end of her days, when nothing we have seen really warrants either such commitment or forgiveness. In other words, love has no reason. Or self esteem. “Yes, it’s possible,” says Julie, “For someone to hit you—hit you hard—And it not hurt at all.” Words that send a chill down the spine. Still, Julie is a fascinating character—a young and naïve factory girl with a spine of New England steel. (“You’re a Queeer One, Julie Jordan” spells it out, I suppose, but the film cut the song, tho it’s on the album). It’s the classic example of the good girl drawn to the bad boy--their lust so palpable that both lose their jobs in one evening and succumb to each other. She’s more exciting and alive in the courtship than she must be later in her saintly endurance of Billy’s transgressions. In the end she’s content knowing she’ll “Never Walk Alone,” a sentiment that even decades later fuels stories such as Ghost. But a bridge across the great divide for forgiveness is a message whose original impact is impossible to recapture. Carousel first arrived as the Great War was winding down; the pain of so many dead was felt by everyone. Hammerstein’s hymn, “You’ll Never Walk Alone,” riding on Rodgers’ defining anthem, hit an emotional chord at the time that even 11 years later, in the film was nowhere near as cathartic or powerful. Carousel is so blinding in its surety, its chutzpah, its breathtaking music—we don’t see, or choose not to see, that its sweet water is drawn from a pretty foul well.